When a partial vacuum develops in the pump intake line, the decrease in absolute pressure results in the formation of gas and/or vapor bubbles within the oil. When these bubbles are exposed to elevated pressures at the pump outlet they implode violently. When bubbles collapse in proximity to a metal surface, erosion occurs. Cavitation erosion contaminates the hydraulic oil and damages critical surfaces. When a partial vacuum develops at the pump inlet, the mechanical forces induced by the vacuum itself can cause catastrophic failure. In vane pump designs, the hydraulic motor vanes must extend from their retracted position in the rotor during inlet. As this happens, fluid from the pump inlet fills the void in the rotor created by the extending vane. If excessive vacuum exists at the pump inlet – it will act at the base of the vane. 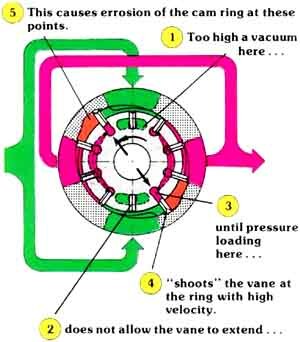 This causes the vanes to lose contact with the cam ring during inlet, and they are then hammered back onto the cam ring as pressurized fluid acts on the base of the vane during outlet (figure 1). The impact damages the vane tips and cam ring, leading rapidly to catastrophic failure. The intolerable noise is referring to is symptomatic of cavitation bubble collapse and the vanes being hammered against the cam ring. Both of these conditions are intensified by increasing system pressure. A filter located outside of the reservoir is preferable to a suction strainer. The inconvenience of servicing a filter located inside the reservoir is a common reason why suction strainers go unserviced – until after the pump fails. 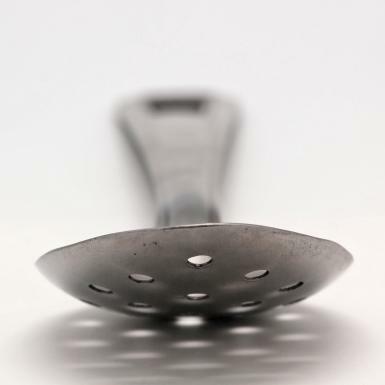 If a suction strainer is installed, opt for 250 microns rather than the more common 150 microns. The filter should be grossly oversized for the pump’s flow rate to ensure that pressure drop is minimized, even under the most adverse conditions. Regardless of the type of filter employed, it must incorporate a bypass valve to prevent the element from creating a pressure drop that exceeds the safe vacuum limit of the pump. A gauge or transducer should be installed downstream of the filter to enable continuous monitoring of absolute pressure at the pump inlet. Our organization offers a wide range of Hydraulic Oil Pumps. Procured from the reliable vendors, our offered range is flawless in nature. The pumps offered in this category are widely used in agriculture tractor industry and hydraulics machines automation. The range offered by us includes Yuken Vane Pumps, Dowty Gear Pump, Polyhydron Radial Piston Pumps and Yuken/Jactech Axial Piston Pumps. Yuken Vane PumpsWe are offering Yuken Vane Pumps with fixed and simple adjustable displacement. 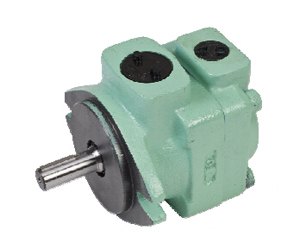 Due to their higher efficiencies than gear pumps, these pumps are widely demanded by the customers. Used for mid pressures up to 180 bars in genre, the pumps offered by us are considered as high pressure components. In order to obtain simple adjustable pump, there are some type of vane pumps that can change the center of the vane body. The adjustable vane pumps are also known as constant pressure or constant power pumps. The displacement is increased, when the required power or pressure is reached. Similarly, displacement or swept volume is decreased until equilibrium is reached. Used in hydraulic industries, power pack manufacturers, automobile and heavy mobile vehicles, these pumps can be customized as per the requirements of our customers. The offered pumps are widely demanded by the customers for their features like high performance, compact designs and strong construction. The pumps offered by us have vanes mounted to a rotor, which rotates inside of a cavity. These vanes are tensioned in order to maintain contact with the walls, while the pump rotates. Moreover, the vanes can be of variable length. Our offered pumps are suited to handle clean fluids with low lubricating features at high pressure. V and VQ INTRA VANE design do great reduce of the high-pressure impact from the vane to the rotor; which do assistant the vane pump to be more stable performance, longer life and lower noise under high-pressure and high-speed circumstance. High pressure, high performance vane pumps designed for low noise operation and ease of maintenance. The working parts of the pump are presented as a cartridge kit and can be replaced for quick, easy repairs. The Yuken PV2R Vane Pumps is frequently used in injection molding systems, as the pumps provide an expansive range of output flow from 5.8 cm3 /rev to 237 cm3 /rev (.354 cu.in./rev to 14.46 cu.in./rev). High Speed Steel is a cutting tool material used in drilling, milling, turning, threading, boring, broaching, gear cutting and many other machining operations. High Speed Steel is used for form tools, slitter knives, guillotine knives, parting tools and many other types of cutting tools. High Speed Steel cutting tools are used in all phases of production and are widely used in both machine tools and in portable machine tools. High Speed Steel is noted for its ability to perform at slow surface speeds, while providing a good surface finish, without chipping or breakage. High Speed Steel offers reliable toughness. 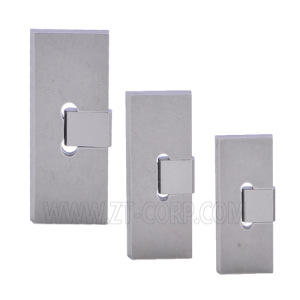 It is commonly used in applications with interrupted cuts and it is notably tougher than carbide and ceramic materials. It also resists chipping in cutting applications. The toughness allows for Steep Positive Cutting Configurations to be generated. The positive cutting tool configurations demand less horsepower and will lower the level of heat generated during the operation when work hardening is a concern. High Speed Steel retains good wear resistance in both metal working and wood working applications. High Speed Steel cutting tools have a sharper cutting edge than carbide cutting tools. The work piece is cut rather than fractured which results in an improved surface finish. High Speed Steel is used in applications where contamination of scrap is a concern. To sum up why we want to use it the best answer. The cost of the tooling materials in a mould usually represents only 5–10% of the tool cost. And it is an even smaller part of the total tooling cost. ZT delivers a series of Plastics Tool Steel and Mould Material Grades for plastics processing which are unmatched in the industry. Our products are manufactured using both conventional and powder metallurgical production techniques. Our close cooperation with tool designers keeps us abreast of the latest demands placed on Plastics Tooling. Tailored to the needs of the various plastics moulding applications, ZT Plastics Tool Steel and Mould Materials are ideal where high polishability, improved resistance to corrosive and/or abrasive polymers, high thermal conductivity, uniformity and reliability are required. Our large stock of Tool Steel, Copper-based Alloys, and Holder Steel can be supplied in the form of bars, cut pieces and blocks, supported by custom machining, sawing and grinding services. From our long experience serving the Plastics Industry we have become very knowledgeable about the sizes, grades and tolerances most frequently required. A new shock-resistant cold work die steel with an excellent combination of toughness and wear resistance may be considered for tooling applications such as coining dies, blanking dies, slitter knives, chipper knives and rotary shears, among others. The new alloy is made by Carpenter’s patented powder metallurgy process known as Micro-Melt Process. Steels made by this method have a refined microstructure with very fine grain size and smaller, more uniformly distributed carbide particles. Eliminated is the segregation found in conventional cast-wrought alloys. Magnification at 1000 times has verified the fine microstructure of the new, highly alloyed material. The fine carbide distribution, combined with low sulfur content, make dies and tools of this alloy easy to polish. This characteristic makes the alloy an exceptional candidate for coining applications. Consistent microstructure gives the alloy its good toughness and consistent, reproducible response to heat treatment. Fatigue resistance under repetitive compressive forces has been outstanding. The alloy balance, particularly nickel, contributes both to toughness and hardness. Wear resistance comes from the grade’s good hardness coupled with the formation of vanadium, chromium and molybdenum carbides. The steel can be heat treated in salt, vacuum or controlled atmosphere furnaces, and secondary hardened at 950°F (1066°C). Using this treatment, hardness levels up to 61/62 HRC can be achieved with low residual stress in the cold work tools or coining dies made from the material. Like other Carpenter Micro-Melt alloys, the new CD#1 alloy is more forgiving during heat treatment than conventional tool steels. In addition to predictable response to heat treatment, the alloy remains more dimensionally stable when making a tool, and exhibits less out-of-round distortion after heat treatment. Machinability is also improved in the annealed condition. The typical analysis of Micro-Melt CD#1 alloy is: carbon 0.70%, manganese 0.40%, silicon 1.00%, chromium 8.25%, molybdenum 1.40%, nickel 1.50%, vanadium 1.00%, nitrogen 0.09%, iron balance. 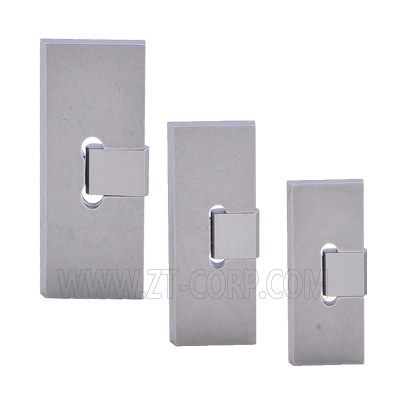 This new material is available in round, square and flat bar; billet and powder. Cold work tool steels are essentially high carbon steels, which contain relatively low alloy additions of tungsten, manganese, chromium and molybdenum. These alloy additions increase hardenability, permitting oil quenching with less distortion than with the W series. These are relatively inexpensive steels, and their high carbon content produces adequate wear resistance for short run applications. It is used for all types of blanking and forming dies, gauges, collets, etc. Cold work tool steels are essentially high carbon steels, which contain relatively low alloy additions of tungsten, manganese, chromium and molybdenum. These alloy additions increase hardenability, permitting oil quenching with less distortion than with the W series. The O series consists of relatively inexpensive steels, and their high carbon content produces adequate wear resistance for short run applications. In this group of steels, many manufacturers market steels of composition adjusted to meet specific requirements. Undoubtedly, this group of steels can be classed among the largest tonnage used for tool manufacture, the reason being that it is the least expensive; affording a high degree of non-distortion in heat treatment and for short run application cannot really be rivaled. It is used for all types of blanking and forming dies, gauges, collets, etc. In 1913, English metallurgist Harry Brearly, working on a project to improve rifle barrels, accidentally discovered that adding chromium to low carbon steel gives it stain resistance. In addition to iron, carbon, and chromium, modern stainless steel may also contain other elements, such as nickel, niobium, molybdenum, and titanium. Nickel, molybdenum, niobium, and chromium enhance the corrosion resistance of stainless steel. It is the addition of a minimum of 12% chromium to the steel that makes it resist rust, or stain ‘less’ than other types of steel. The chromium in the steel combines with oxygen in the atmosphere to form a thin, invisible layer of chrome-containing oxide, called the passive film. The sizes of chromium atoms and their oxides are similar, so they pack neatly together on the surface of the metal, forming a stable layer only a few atoms thick. If the metal is cut or scratched and the passive film is disrupted, more oxide will quickly form and recover the exposed surface, protecting it from oxidative corrosion. (Iron, on the other hand, rusts quickly because atomic iron is much smaller than its oxide, so the oxide forms a loose rather than tightly-packed layer and flakes away.) The passive film requires oxygen to self-repair, so stainless steels have poor corrosion resistance in low-oxygen and poor circulation environments. In seawater, chlorides from the salt will attack and destroy the passive film more quickly than it can be repaired in a low oxygen environment. The three main types of stainless steels are austenitic, ferritic, and martensitic. These three types of steels are identified by their microstructure or predominant crystal phase. Austenitic steels have austenite as their primary phase (face centered cubic crystal). These are alloys containing chromium and nickel (sometimes manganese and nitrogen), structured around the Type 302 composition of iron, 18% chromium, and 8% nickel. Austenitic steels are not hardenable by heat treatment. The most familiar stainless steel is probably Type 304, sometimes called T304 or simply 304. 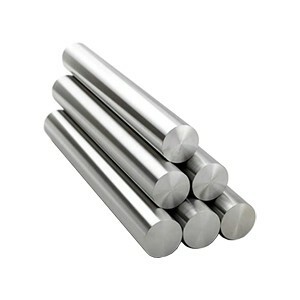 Type 304 surgical stainless steel is an austenitic steel containing 18-20% chromium and 8-10% nickel. Ferritic steels have ferrite (body centered cubic crystal) as their main phase. These steels contain iron and chromium, based on the Type 430 composition of 17% chromium. Ferritic steel is less ductile than austenitic steel and is not hardenable by heat treatment. There are also other grades of stainless steels, such as precipitation-hardened, duplex, and cast stainless steels. Stainless steel can be produced in a variety of finishes and textures and can be tinted over a broad spectrum of colors.